Windows Vista places your most frequently used items in the Navigation Pane. The Navigation Pane, shown in the following figure, is found along the left edge of every folder. Documents: Click this shortcut to return straight to the mother of all folders, your Documents folder. Recently Changed: You guessed it: Clicking this shortcut lists every file that’s changed in the past 30 days. They’re sorted by date, with the most recent file at the top, making it a handy way to locate your latest work. Pictures: This shortcut opens your Pictures folder, living quarters to all your digital photos. Music: Yep, this shortcut jumps straight to your Music folder, where a double-click on a song starts it playing through your PC’s speaker. Searches: Click this shortcut to see Vista’s collection of Saved Searches: Things you’ve searched for in the past. Several handy searches already live here: every piece of e-mail you’ve received in the last seven days, for example. Public: Drop a file in here to share it with everybody using your PC. 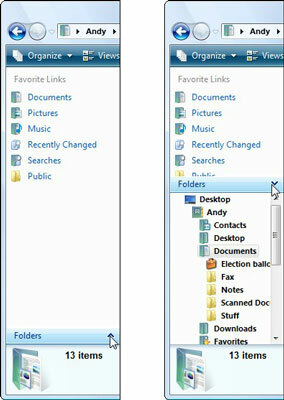 Folders: The Navigation Pane’s hidden door hides behind a single word called Folders. See the word Folders at the bottom of the Navigation Pane? Click anywhere on that folder bar, and the Navigation Pane displays a “branching tree” view of your folders. It’s an easy way to jump to any folder or drive on your computer.